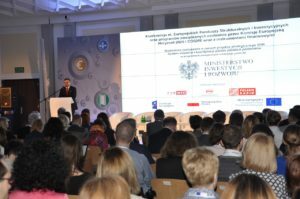 The representative of the Eastern Cluster ICT – the coordinator of the CLUSGRID project took part in the panel of experts during the conference entitled “European Structural and Investment Funds and centrally managed programs by the European Commission, Horizon 2020 and COSME together with financial instruments”. The conference was organized by the Ministry of Investment and Development. On April 5, ministerial officials and external experts discussed what should be done to get Poland to acquire billions of euros for investments from programs managed by Brussels. The leitmotifs were the Horizon 2020 and COSME programs. It was the second meeting devoted to working out solutions that would enable Poland to take more advantage of EU money. In turn, under the Connecting Europe Facility (the most important investments in transport, telecommunications and energy in the EU), almost EUR 30 billion is available.